Helen – the first child of William and Susan, born 19 February 1871 (birth certificate number either 1871/950 or 1872/13181 this second has spelling Stannaway – both certificates are William and Susan as parents) in the district of Helensville, we suspect in the township of Tokatoka, Kaipara, Northland. Helen Stanaway – Tide of Times. (If you have the original photograph can you please contact the Editor). We have no records of her early life including when she left the Kaipara area. Her first 40 years we can only assume that she grew up in Aratapu, where she may have gone to school. I suspect that she, when old enough was kept at home to help her mother with running the house and raising her other siblings, especially as her brother William may have had special needs. At some point she leaves Aratapu, I suggest this is around 1909-1910, when her father and mother move to Auckland, again this suggests that she was helping her mother in the home for the early part of her life. Our first record is in the 1911 Electoral Roll and has Ellen living in Panmure Road in Ellerslie, Auckland and listed as a spinster, she is 40 years old. About this time she moves to Rotorua and kept a private boarding house. By 1915 due to failing health she gave this up and worked as a laundress. (Note her younger brother, Alexander is also living in Rotorua). By 1917 Ellen is living in Rotorua as a laundress, she appears in the Auckland Star newspaper on 5th June 1917 being adjudicated a bankrupt having applied. In 1920 Ellen marries James Diver (Jim) in James’ house on Hinemoa Street, Rotorua (Marriage Certificate number 1920/11481). Helen is 49 years old (stated as 47 years on the marriage certificate) and no children are born by this marriage. James is the son of Frank Driver and Jane Woods, he was born in Auckland, his father was listed as a labourer. Ellen appears to be closest to her brother Jack (John James). 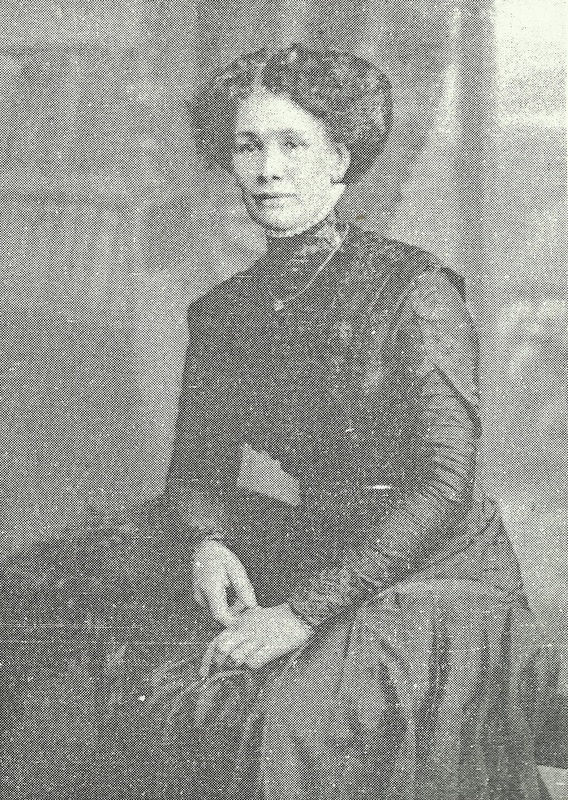 When he dies in 1931, her comment is placed at the bottom of his headstone “Always remembered by Ellen”, she goes on to place an in memorial on the anniversary of his death in the New Zealand Herald, she is still living in Rotorua. Ellen has moved with her husband back to Auckland and according to the 1946 Electoral Roll they are living at 1 Taumata Road, Mt Albert. In 1954 they move next door into 3 Taumata Road, Mt Albert. (I suspect that the original sections on the street were all subdivided and the entire street was renumbered). Helen’s Grave site – Otahuhu Cemetery. 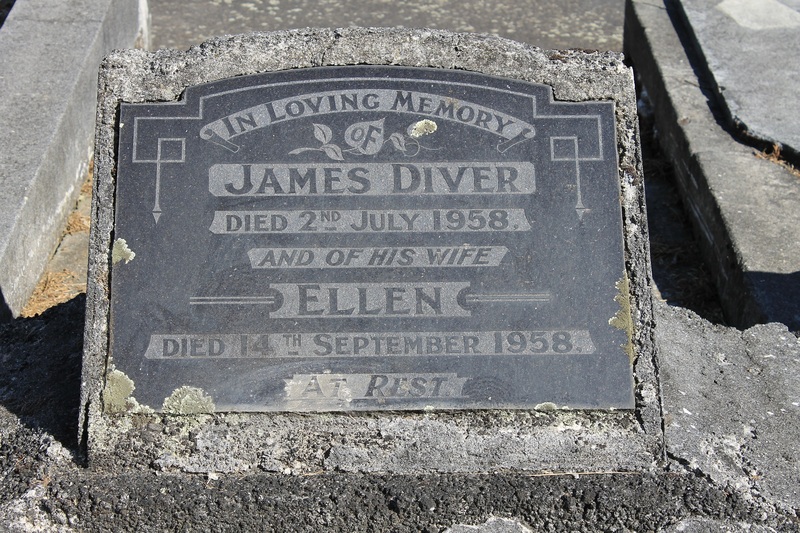 James Diver dies on 2nd July 1958, 3 months later on 14th September 1958 Ellen also passes away aged 87, (Death Certificate number 1958/29912). James and Ellen are buried side by side in the Otahuhu Cemetery area 3 plot 175, not far from her mother Susan and brother Jack (John James).